Israel breathes a sigh of relief as trump leaves the region with no offer of a “deal” allowing it to continue to kill, displace, arrest and torture Palestinians take their land and water and give it to Jews. Trump’s visit to Jerusalem was like Cesar coming to visit the far away provinces. Israel welcomed him with smiles, flags and a perfectly orchestrated military parade, while Palestinians signaled their feelings by staging an all-out general strike – the first all out strike that included 1948 Palestine in over twenty years. The strike and protests, the significance of which likely went over Trumps head, was also an expression of solidarity with hunger-striking prisoners who at this point have gone without food for close to forty days. Trump flew into Tel-Aviv from Saudi Arabia where he announced the US-Saudi weapons deal which will surely result in the death of many innocents in Yemen. Standing by the corrupt and aging Saudi King Salman, Trump announced that the weapons deal was worth many billions of dollars and, he made sure to add, this deal is an investment in the US and will provide “jobs, jobs, jobs” for Americans. In Jerusalem the media could not, and still can not get enough of Trump. No one even complained about the fact that even though Trump flew from Tel-Aviv airport to Jerusalem, the highway connecting the two cities was closed for several hours “just in case.” On a morning news talk show, a panel which included the entire Zionist political spectrum discussed the Trump visit and was obvious from their discussions who is really in charge here. It was not the representative of the “sane” liberal Zionists nor the representative of the “right of center” Likud but rather the wild eyed zealot Daniella Weiss, the voice of the the extreme most religious zealots settlers. She began by saying that Trump will bring no change because even Trump the great deal maker cannot undo what was agreed upon between God and the Jewish people when He promised “us” the Land of Israel. Then she stated that now there are 750,000 Jews living in Judea and Samaria, and not one of them can or will ever be removed. “What about three million Palestinians?” she was asked and she made it clear that they are not part of the messianic vision that she holds. The number three million is how Zionists view the world. While over six millions Palestinians live in Palestine, only the Palestinians in the West Bank are counted. Weiss was challenged by Omer Bar-Lev a veteran of the liberal Zionist Peace Now group and member of Knesset with the “Zionist Camp” party who passionately claimed that “people like her are destroying the Zionist vision” because they are forcing a reality where we (the Jews) will no longer be a majority and we will end up in a bi-national state, (this is coming from the “left”). The difference between zealot fanatics like Daniella Weiss and the liberal Zionists is that the former don’t see Palestinians, and the latter have a recurring nightmare whereby Israel is forced to grant Palestinians citizenship rights. Both sides believe though that as long as the Palestinians have no rights Israel can claim to be a Jewish State. Daniella Weiss represents the true face of Zionism which has always maintained that Jews ought not to worry about trivial matters such as a few million Arabs. Bar-Lev, who commanded one of Israels’s most murderous commando units, represents the fig leaf which which to cover up the true face of Zionism. When one travels to the South Hebron Hills region, which is mostly a wild and beautiful desert, spotted with Palestinian towns and tiny villages one sees the Zionist vision in action. The Palestinian villages are tiny, fifteen or twenty families living in caves and tents, some have built homes. There is usually no running water or electricity and very few paved roads. Even after fifty years of Israeli control, the water, electricity and paved roads didn’t reach these remote areas until Jewish settlers came. As soon as Jewish settlers showed up, they kicked the Palestinians off of their land, and built “outposts” which are like a baby settlements. 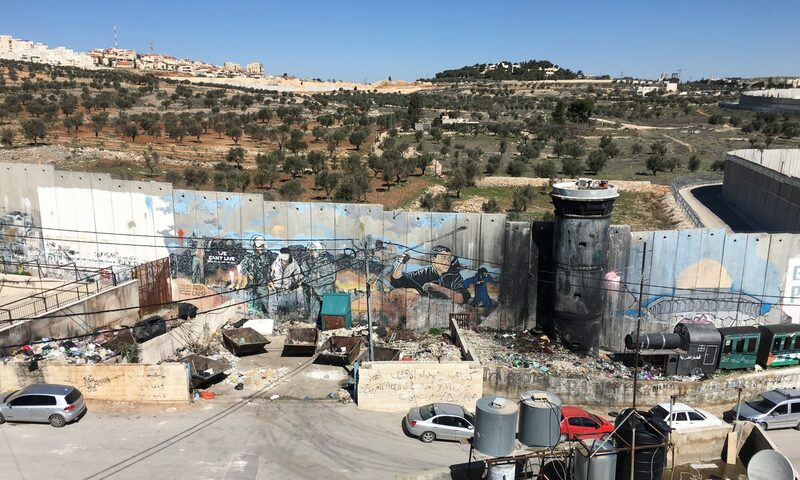 Then, miraculously, running water, electricity and well paved roads appeared almost immediately, although they stopped short and did not reach any of the surrounding Palestinian villages. This is how the Jews make the desert bloom. “We can sense that Trump is a great friend,” a Likud operative said on television. “He speaks of peace, and of course we too want peace, but we have no partner for peace. So while he (Trump) talks of a “deal” we can read the signs.” The signs being the new US ambassador, who is as true a Zionist as Daniella Weiss and of course, the son-in-law. I was reprimanded once for stating that the son-in-law is Jewish, as though it shouldn’t matter but if anyone thinks that Jared Kushner’s being Jewish is not relevant they can ask any Israeli on the street. They will tell you exactly what a “good friend” he is to Israel and how much money his family has given to settlements and the IDF. So to sum up Trump’s mideast policy, the Saudi dynasty is safe and can keep killing Yemeni civilians using the best technology money can buy and in doing so they are also providing “jobs, jobs, jobs” for Americans. Trump is a great friend to Israel, we all agree that Israel has no partner for peace, and unlike Obama, Trump it seems will place no restrictions on Israel’s settlement expansion and ethnic cleansing campaign. It is a great day for Israel when the Emperor comes to visit! All depressingly correct Miko. I still don’t think Kushner’s ethnicity is relevant, not all Jewish people are Zionists, and many non-Jewish people support Zionism, especially among the Christian Right, but I am not going to fall out with you, your sane analyses are far too important to me! When, inevitably, Trump steps down before he is impeached, citing health problems or whatever, Spence will be probably be more of a sycophant to the Israeli right and Aipac. Dark days. To me it all shows the vacuousness of Zionism, religious or secular. True Judaism has laws, thou shall not kill or steal being two of them. If the so called ‘religious’ Zionists cared about those laws as much as their messianic vision, we wouldn’t have all these settlements preventing peace.